The Food Service Resume Examples is for a Director of Dining with over 15 years the industry. 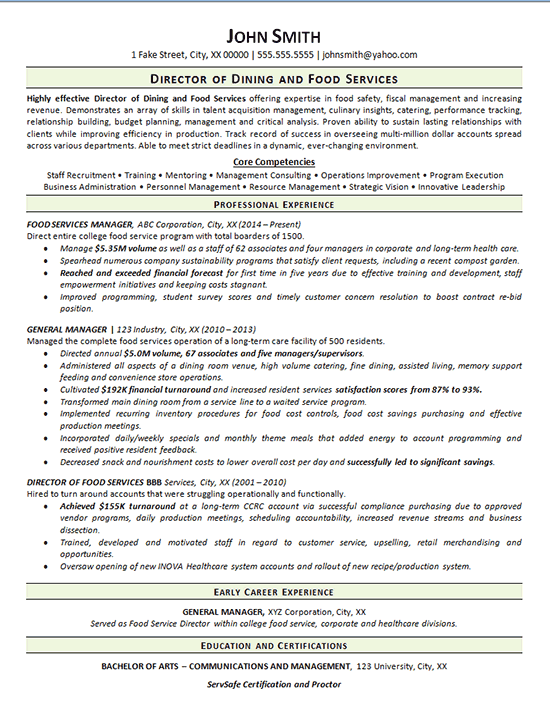 This food services resume was created for a client hoping to advance in his career in Dining and Catering Services. One challenge for this resume is that the job seeker wanted to protect his age from potential employers. This food service professional was concerned they would be discriminated against due to his age. Multiple options were weighed in how to best highlight his strengths and hide his age while remaining consistent in approach. It was decided to go into detail for all of his positions except the first job. This position was held for almost twenty years so including the dates of employment would give away their age. The dates couldn’t be omitted for one job and not the rest in the same section. That is why that one job was included in an Early Career Experience section. Additionally, no dates were included in the education section either. To grab the reader’s attention and ensure the client’s strengths were immediately evident, a Core Competencies section was utilized to list qualities that would interest employers. The ServSafe Certification was also included in this food services resume because that is a very relevant and important certification for this field. Highly effective Director of Dining and Food Services offering expertise in food safety, fiscal management and increasing revenue. Demonstrates an array of skills in talent acquisition management, culinary insights, catering, performance tracking, relationship building, budget planning, management and critical analysis. Proven ability to sustain lasting relationships with clients while improving efficiency in production. Track record of success in overseeing multi-million dollar accounts spread across various departments. Able to meet strict deadlines in a dynamic, ever-changing environment. Manage $5.35M volume as well as a staff of 62 associates and four managers in corporate and long-term health care. Spearhead numerous company sustainability programs that satisfy client requests, including a recent compost garden. Reached and exceeded financial forecast for first time in five years due to effective training and development, staff empowerment initiatives and keeping costs stagnant. Improved programming, student survey scores and timely customer concern resolution to boost contract re-bid position. Directed annual $5.0M volume, 67 associates and five managers/supervisors. Administered all aspects of a dining room venue, high volume catering, fine dining, assisted living, memory support feeding and convenience store operations. Cultivated $192K financial turnaround and increased resident services satisfaction scores from 87% to 93%. Transformed main dining room from a service line to a waited service program. Implemented recurring inventory procedures for food cost controls, food cost savings purchasing and effective production meetings. Incorporated daily/weekly specials and monthly theme meals that added energy to account programming and received positive resident feedback. Decreased snack and nourishment costs to lower overall cost per day and successfully led to significant savings. Achieved $155K turnaround at a long-term CCRC account via successful compliance purchasing due to approved vendor programs, daily production meetings, scheduling accountability, increased revenue streams and business dissection. Trained, developed and motivated staff in regard to customer service, upselling, retail merchandising and opportunities. Oversaw opening of new INOVA Healthcare system accounts and rollout of new recipe/production system.